From the picture above with no Fairings and a modified Mountain bike and stem. Mounted a Quick release Throttle cable and grip. I started to change my idea on having it as a cruiser bike but instead a more sturdy long telescopic Fork. Although from the picture above of my suzuki crystal the swing-arm are already been modified with a Moto-R alloy swing-arm. Now I was reading all over the MCP forum regarding the Good and Bad on Mono-shock swing-arm. Although It looks like beautiful but it seems the idea of having the bike to stand on a Mono-shock are still being unfavored. 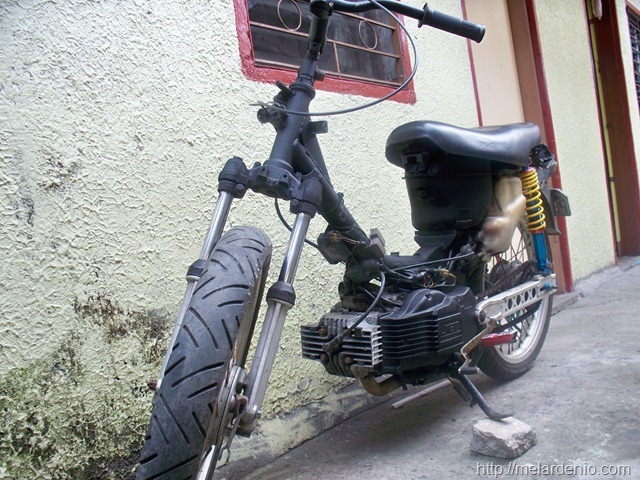 I notice that on the forum that if your bike is not designed for a monoshock swing-arm it shouldn’t be converted. The wheel base would suffer since the rear wheel will be more longer compare to the stock length. Now, here is the progress of my Project Bike. Mounted is a Raider 150 T-post and Butterfly. No more conversion on the COPA and the Bearings. All straight swap on my old stock Suzuki crystal ‘s T-post. Also mounted is an XRM replacement telescopic Fork. The Diameter of the Telescopic fork is fitted well with the Raider 150’s Tpost. If you are also looking to change your T-post this is the best T-post to use. Also on the Center Hub, I use the Honda XRM Hub assy. Also notice the Spacer and collar on the other end. All of the are from Honda XRM Assy. Tomorrow I will be moving the RIMS on this Hub. On monday, I will be picking up the Master and Caliper for the Disk Brake Assembly. Want to know more? Subscribe on this website.